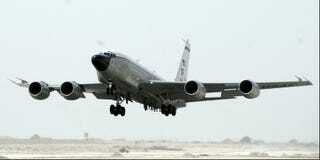 The Boeing RC-135 is the most effective American spyplane you've never heard of. It's the John Paul Jones to the SR-71's Robert Plant—a quiet workhorse that has flown over countless US missions while providing vital, real-time signals intelligence. Dubbed the "Rivet Joint", these heavily modded KC-135's have been in operation since 1964, a replacement to the USAF's aging fleet of RB-50 Superfortresses. From Vietnam to Grenada to the Balkans to Iraq, Libya, and Afghanistan, these planes have flown in every armed conflict involving U.S. assets since their introduction. Originally assigned to Strategic Air Command, the 22 RC-135's that make up the 55th Wing—3 RC-135S Cobra Balls, 2 RC-135U Combat Sents, and 17 RC-135V/W Rivet Joints—are now under the control of Air Combat Command and operate out of Offutt AFB in Nebraska. Designed as a dedicated SIGINT (signals intelligence) platform, the Rivet Joint's crew can monitor wide swaths of the electromagnetic spectrum—from ELF radio signals to microwaves—intercept these transmissions from up to 240 km away, and then either forward the data back to HQ or analyze it onboard and disseminate it directly to ground troops using the platform's extensive communications suite. The five-man crew is routinely augmented with up to 25 additional electronic warfare officers, intelligence operators, and in-flight maintenance technicians in order to make this happen. RIVET JOINT (RC-135V/W) is an air refuelable theater asset with a nationally tasked priority. It collects, analyzes, reports, and exploits enemy BM/C4I. During most contingencies, it deploys to the theater of operations with the airborne elements of TACS (AWACS, ABCCC, Joint STARS, etc.) and is connected to the aircraft via datalinks and voice as required. The aircraft has secure UHF, VHF, HF, and SATCOM communications. Refined intelligence data can be transferred from Rivet Joint to AWACS through the Tactical Digital Information Link TADIL/A or into intelligence channels via satellite and the TACTICAL INFORMATION BROADCAST SERVICE (TIBS), which is a nearly real-time theater information broadcast.